Rejuvenate and unwind. Wonderfully relaxing, “mountain style,” spacious 1 bedroom condo located directly on the beautiful Roaring Fork River located just a few blocks from the main Gondola in the heart of downtown Aspen, CO. A calm respite, a place where you can enjoy nature and still be in the heart of downtown Aspen. The condo unit has a large heated swimming pool,2 hot tubs and a fitness center that are all open year round. Enjoy the exquisitely scenic outdoors and decompress from your every day life in the comforts of Chateau Roaring Fork. Property address is Chateau Roaring Fork, 1039 East Cooper Street at the end of a quiet cul-de- sac. Aspen is well-known for its world-class skiing and is rated one of the top ski resorts in North America by Conde Nast Traveler Magazine. It also offers a variety of recreational activities that include mountain climbing, horseback riding, fly-fishing, hiking, and ballooning all while enjoying the breathtaking beauty throughout the year. Chateau Roaring Fork is steps away from the world-class restaurants, boutiques, galleries and nightlife that make Aspen legendary. Fabulous location and incredible river view. Great host too! Comfy and warm, but thin walls! I was very excited arriving to the place. Nice location! Very quiet. Perfect for a single person or a couple. Easy walk to City Market, restaurants and shopping in downtown Aspen. 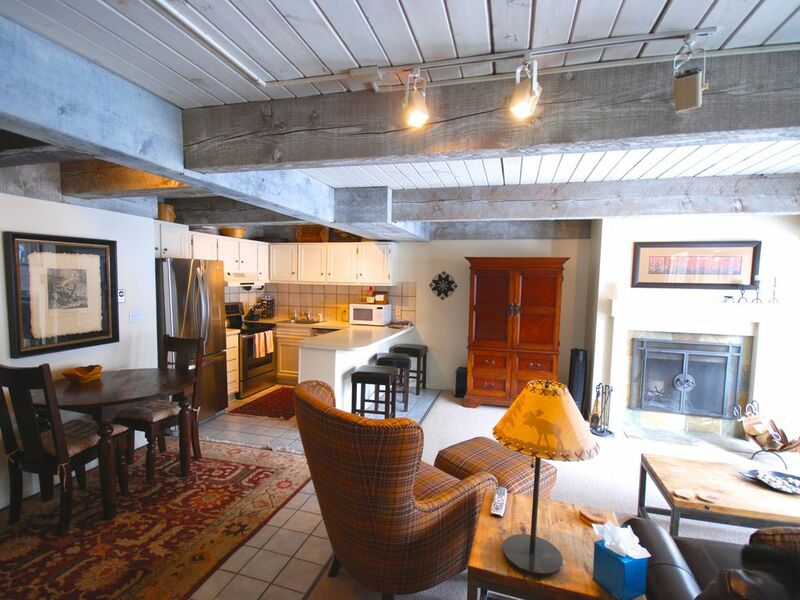 Centrally located within downtown Aspen so you don't have to drive to go shopping or hit any of the restaurants. We had everything we needed and it was very nice. Not the place I thought it was going to be! The overall quality of the condo is poor. The bathroom tub faucet hardly works. Bathroom itself is so small that only one person can fit. Almost no storage. We had to leave our clothes in our suitcases. The same cheap floor tile is used on the walls of bathroom and kitchen. There are live electrical wires hanging from the den ceiling. The owner should seriously update the entire unit. The pool and jacuzzi both need huge upgrades. I wouldn’t rent again. I apologized to my wife for renting it.